ArkMoon.com has been rebuilt from scratch and is officially live! You can now bookmark your voter information by simply adding your voting wallet address to the end of the url to see a quick “at a glance” view at the top of the site of your average payout and payout duration. If you see any issues with the site, please pm me here or in the Ark Slack. Thanks again to all my voters for your continued support! @digitron I am always open to votes! You can see approximately how much you can expect to receive per day with the calculator at the top of my website, http://www.arkmoon.com and takes your amount into consideration. Note that this daily amount may change depending on other voters shifting their weight. Please let me know if you have any other questions or need me to change your minimum payout at any time if you want to get paid less frequently to save on TX fees. I can only adjust the frequency of payouts by adjusting your minimum payout amount. Otherwise, it’s typically paid out daily. Despite the current bear market, ArkMoon will maintain a 95% share rate, but hopes that voters can contribute at least 600 Ark in monthly donations to support new relay nodes and upcoming Ark projects. I joined the Ark community back in June, 2017, and became a forging delegate that October. Since then, I’ve forged over 70,600 blocks and have distributed more than 134,000 Ark to my voters. My current up-time is at 99.43%. In my time as a delegate, I’ve refused extortion attempts from whales trying to get more than their fair share. I’ve built websites like BuyWithArk.com and api.paywithark.com to try and find more useful applications for Ark. I’ve helped delegate Goose build PythACES that allowed people to trade Ark and bridge chains, like Persona. I’ve been an active participant in the Ark community and have made myself available to my voters. With the combination of the recent networking issues and the low price of Ark in this bear market, it has been increasingly difficult to be financially stable as an Ark delegate. Most active delegates are technology professionals, myself included. The costs involved with maintaining these nodes goes beyond simply the cost of hosting, but the opportunity cost each of us spends on Ark versus other more profitable endeavors. Most of us would charge upwards of $100-150 per hour in traditional freelance jobs, but we work for less than $15 a day on the Ark network. At this time, I will not be penalizing my voters by lowering my share rate. My promise of 95% is the reason you voted for me in the first place, and I am privileged to be in the top 51 thanks to you, my voters. Consequently, though, this does not leave me any room to spin up new Ark relays, which is desperately needed to support the Ark network. I currently have 2 mainnet relay nodes, 1 mainnet node, and 1 devnet node, as well as other servers I maintain for my Ark websites. I would love to increase these numbers but cannot with my current share rate. If I can rely on you, my voters, to support my efforts by sending voluntary contributions, I will not need to lower my share rate. My goal is to reach at least 600 Ark per month in voluntary contributions, which will go directly towards increasing my relay node count and supporting development of my Ark websites. Without these donations, it is likely I will need to drop my share rate down to at least 90%, which I do not want to do unless absolutely necessary. Or if you want to get something in return, visit BuyWithArk.com and purchase Brass ArkMoon Gift Coins. Sales of this coin support my web development and hosting costs. BuyWithArk.com - Complete code re-write that will allow people to register and sell their own products for Ark. An art heist game currently in pre-production, more details to follow as it develops. Rebuilding my delegate site in preparation for Ark core v2. Again, I would like to thank my voters for your continued support. I would like to thank the Ark Ecosystem and all the delegates for maintaining the network and making this possible. The goal of BuyWithArk.com is to create an ecosystem for trading, allowing people to buy and sell physical goods using Ark. The site is currently locked down to just three trusted sellers that have proven themselves reliable in the Ark community. This includes myself (ArkMoon), Goose, and Doubled1c3 (owner of ArkStickers.com). The long-term goal is to build a feedback and escrow service that will provide buyers with more protection. That will be in the works starting now and moving forward into the future. Orders that are placed during this weekend should be shipping out this Monday. All orders moving forward should ship out within 24-48 hours, not including weekends or holidays. Buy With Ark is about 95% complete. The entire ordering process is finished and the site will live-update as soon as your payment hits the blockchain. All that’s left for the initial pilot launch is some final bugfixes and a security check and we should be good to launch on Sunday if all goes well, and will include my brass Ark coins, and Goose’s custom Ark coins. Phase 2 will include adding additional sellers to the site and eventually setting up a service that will allow anyone to start selling on it with BuyWithArk acting as an escrow, with feedback for sellers and buyer protection, but that will take a while to establish. Stay tuned! Just a quick update, the BuyWithArk site is coming along nicely. The frontend is built, and I’m just integrating the backend endpoints to accept Ark as payment! The first iteration of this site will be selling the Brass Ark coin I’ve been talking about for months. They’re all packaged up and ready to ship as soon as the website is ready, which should be hopefully around Thursday this week. I will make an official announcement as soon as the site is available. The first batch of coins is limited to 140, and come with a Limited Edition custom packaging that will not be produced after this batch, so make sure to grab one before they’re gone! After this batch sells out, I will produce more brass coins in batches depending on pre-orders and may take 2-4 weeks to create more, but I will continue to create coins based on demand, but after 2018 is over, this particular design will no longer be produced. Thank you, my voters, for your continued support! Also, I’d like to thank all of my voters for your continued support! 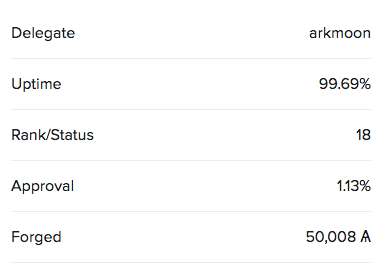 ArkMoon has reached over 50,000 Ark forged! Thank you so much to all of our voters for making this possible! Thank you again, voters! We have much more in the works and hope to make 2018 a great year for Ark! I wanted to use the official Ark QR Code generator the team just released, but for the life of me, I couldn’t get it working inside of my React application. So, I said to heck with it and rewrote the whole thing as a standalone React component. Please let me know if you have any issues or spot any bugs. I just uploaded it to NPM so hopefully everything is working. We recently had a large voter trying to extort us by voting us out of the top 51 and then offering to get us back in by giving them more than their due share of the rewards. He was refused. Thankfully, we are still in the top 51 and rewards are still being paid out without any manipulation. I will not compromise the integrity of my automatic payout script in order to cater to manipulative whale voters trying to play the delegates against each other for an extra 8 Ark per day more than he was due. That belongs to all of my voters, and I am thankful we are still in the top 51. I would like to thank my number one largest voter for making this possible without any special demands. Looks like your connection to arkmoon was lost, please wait while we try to reconnect.